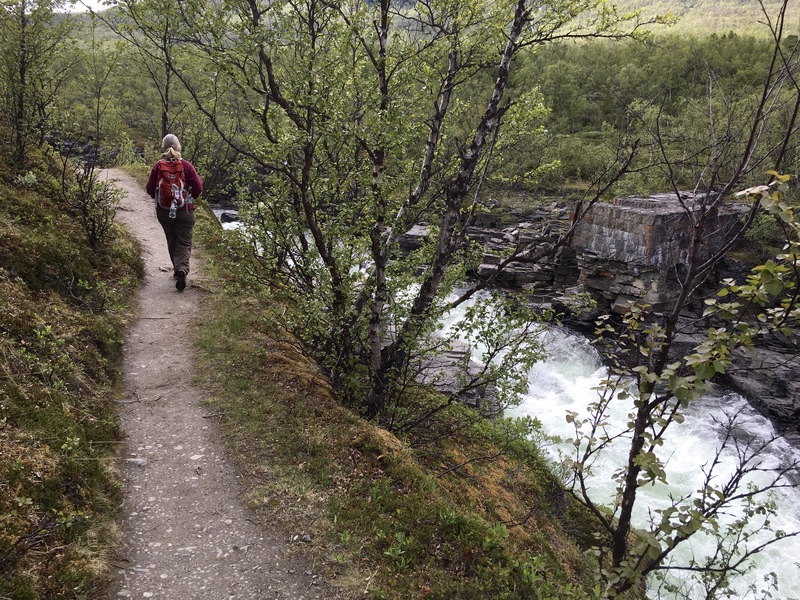 We timed our travels in Northern Scandinavia well with hikes on cool, dry days and driving on rainy days. As you saw, the best weather of all was when we most wanted it: for the vistas from the summit of Mt. Njullá. 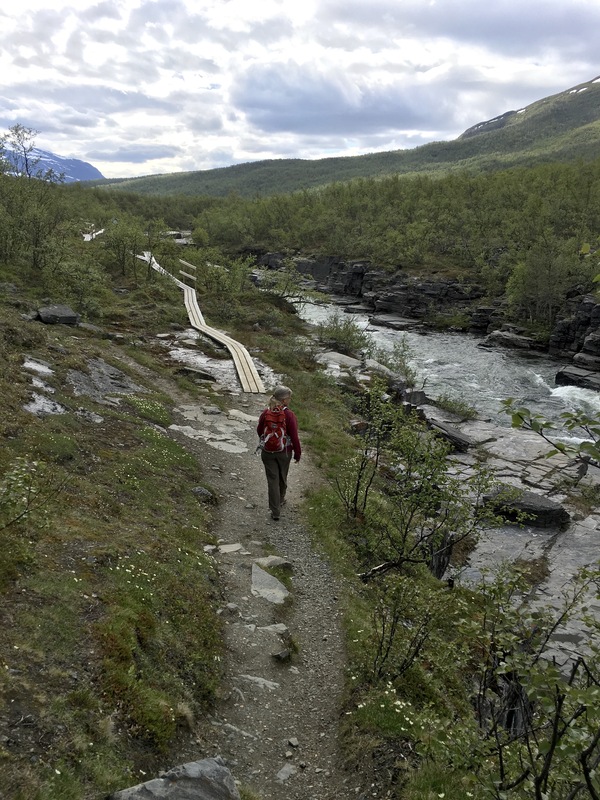 The weather held for the rest of the day as we hiked south on the Kungsleden, the King’s Trail, following the Abiskojåkka, the Abisko River. 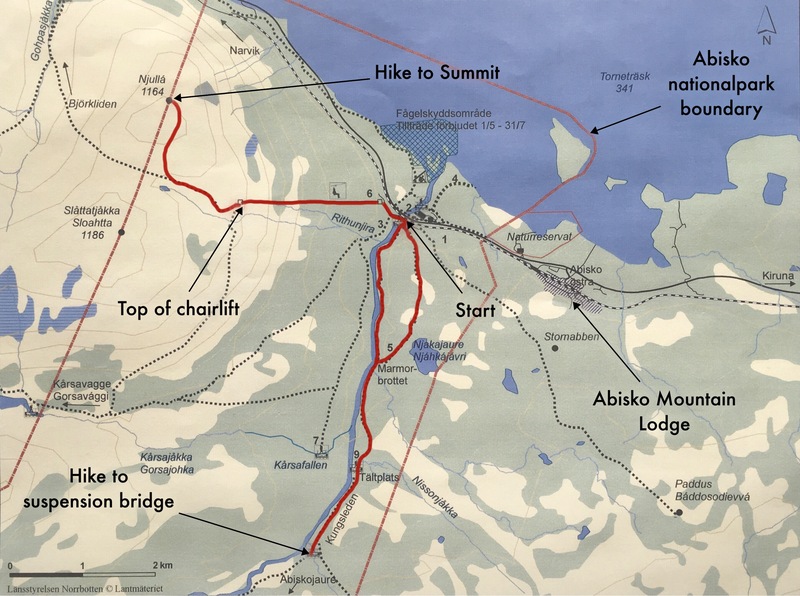 Here’s a map of our route that also shows our trip up to the Njullá summit. 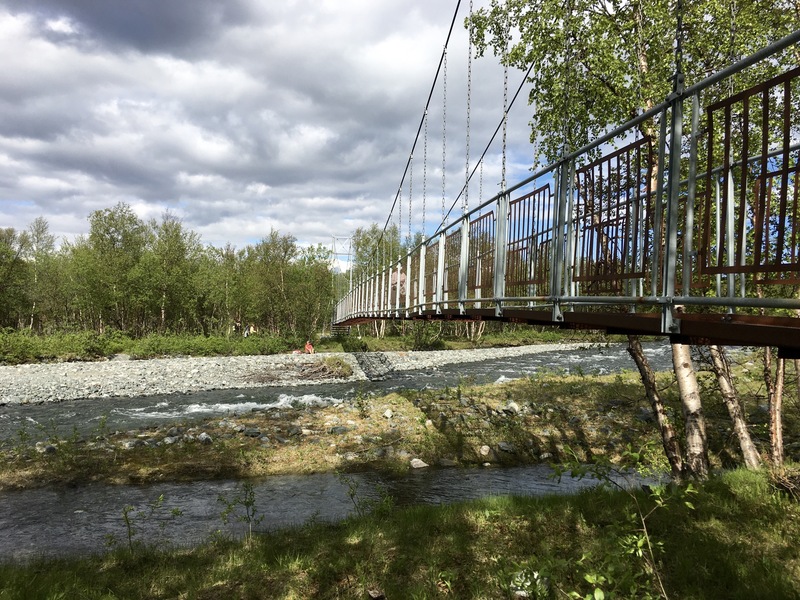 The hike along the river was a 7 mile roundrip, turning around at the suspension bridge over the Nissunjåkka, the Nissun River. 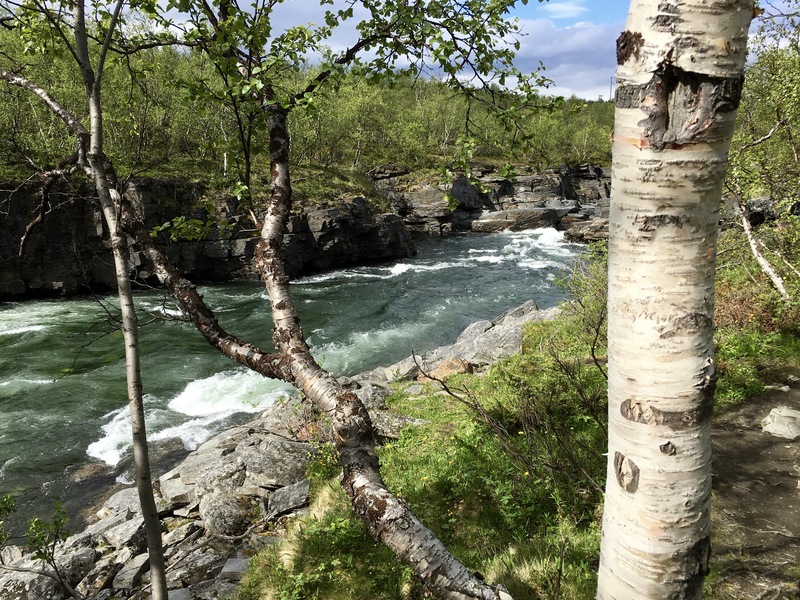 The trail along the Abiskojåkka went through varied terrain, but was also within eye- or ear-shot of the river. 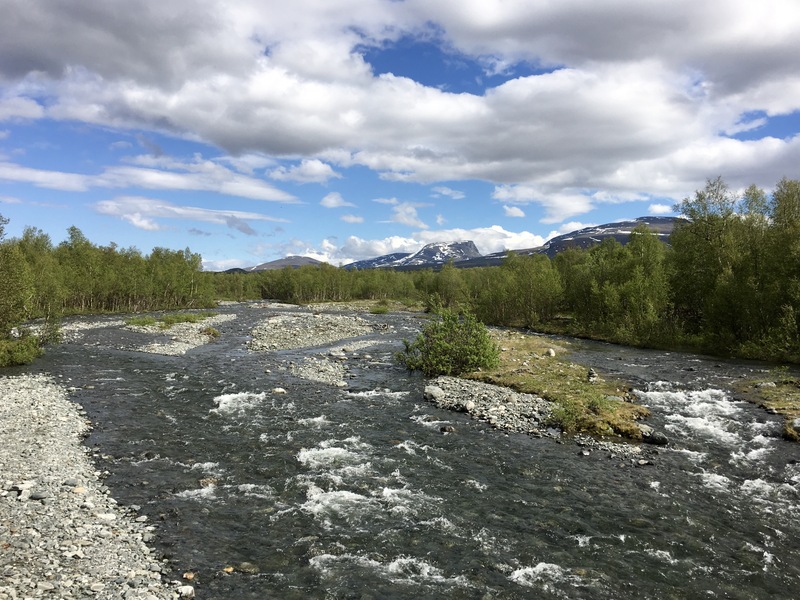 With all the melting snow, the Abiskojåkka is really flowing. 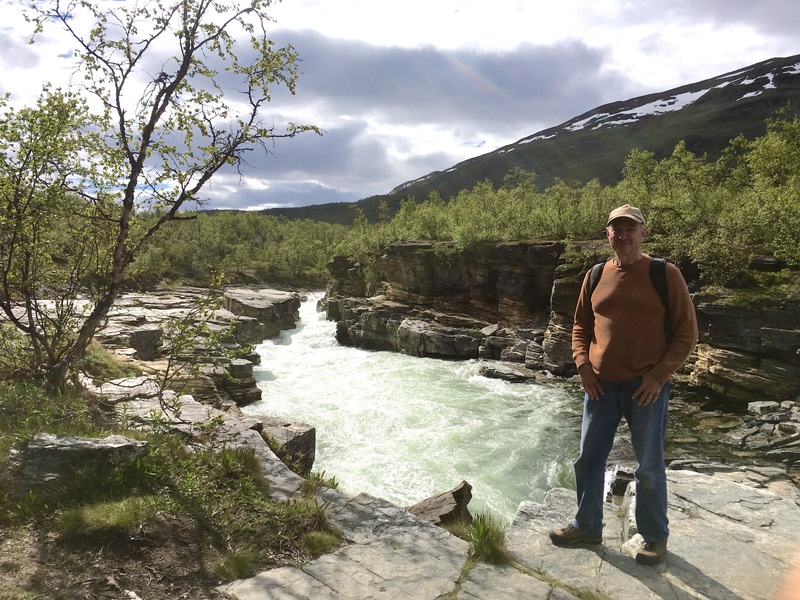 We paused only briefly to take in the scenery, then continued south along the trail. Because this is a national park, the trails are well marked. 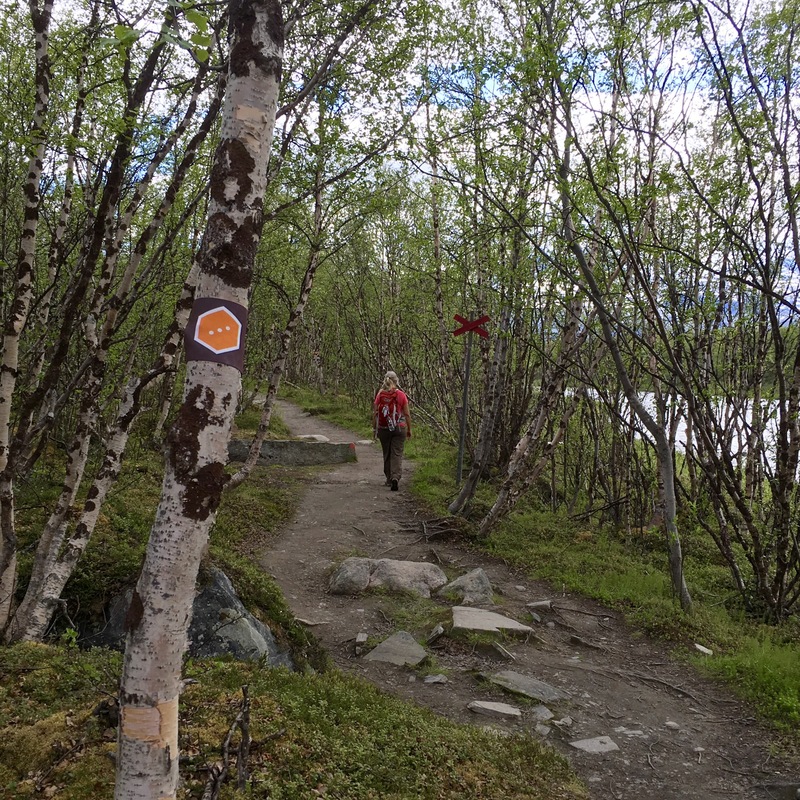 In the photo, above, you can actually make out three different trail markers: 1) the orange tree marker with 3 white dots for the Njakajaure, the Nature Trail; 2) the red X that marks the winter trail (probably for cross-country skiiers); and, 3) the single red mark painted on the stone to Dale’s left in the middle of the trail that marks the Kungsleden, the King’s Path. 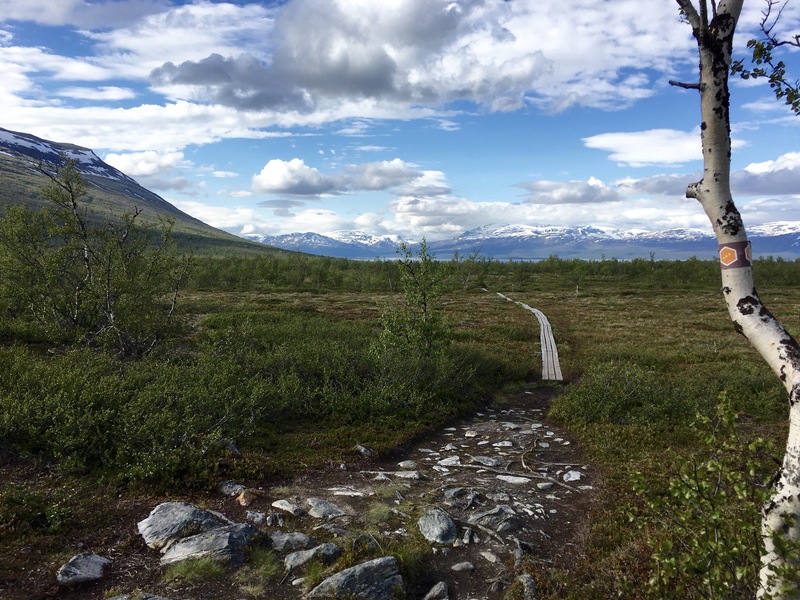 Shortly after I took this photo, the Nature Trail veered off to the left; we continued on the King’s Trail, but on our return, we took the Nature Trail back. 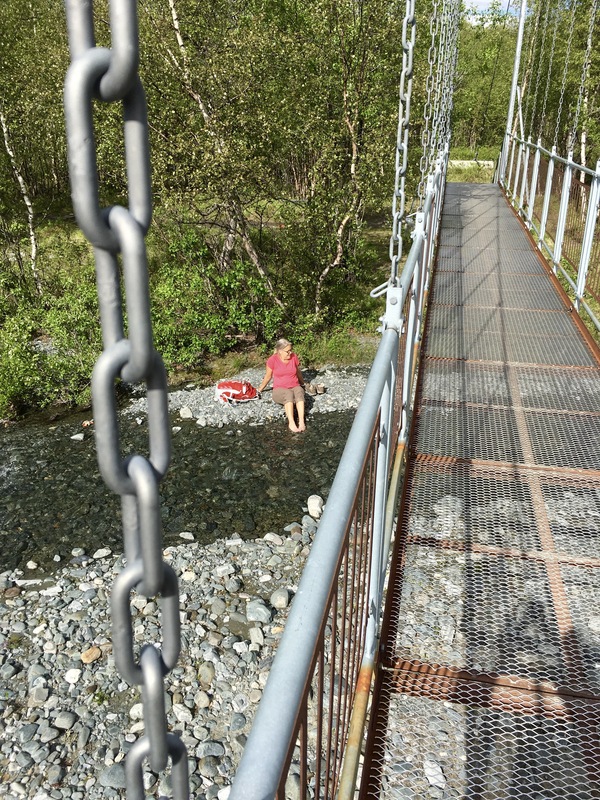 Another 2 miles upriver, we reached the confluence of the Abiskojåkka and the Nissunjåkka and the suspension bridge that spans the latter river. Dale had been anxious to dip her toes in the river. …then back at Dale from the other side of the river. 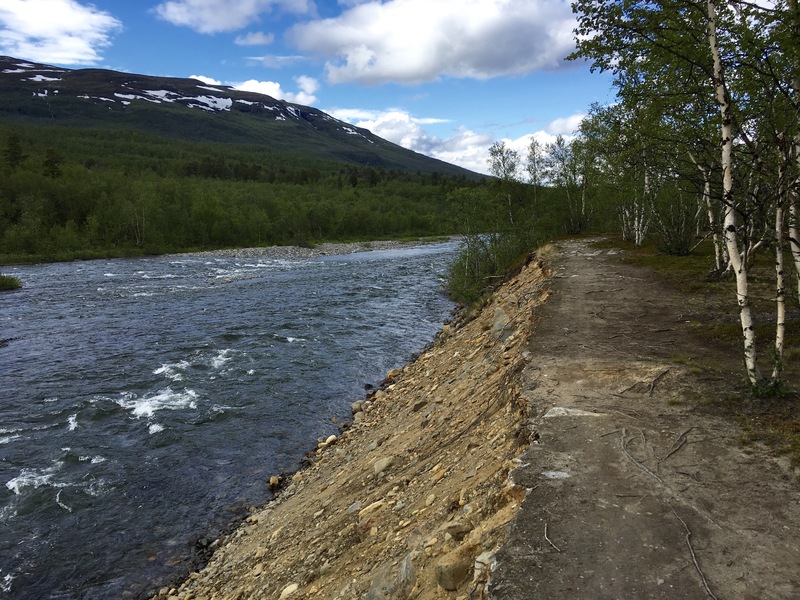 There is one place along the Abiskojåkka where a slight bend has caused the river to wash away the bank. Ignoring the warnings, we carefully hiked along this section for a while until we returned to the junction of the King’s Trail and the Nature Trail. 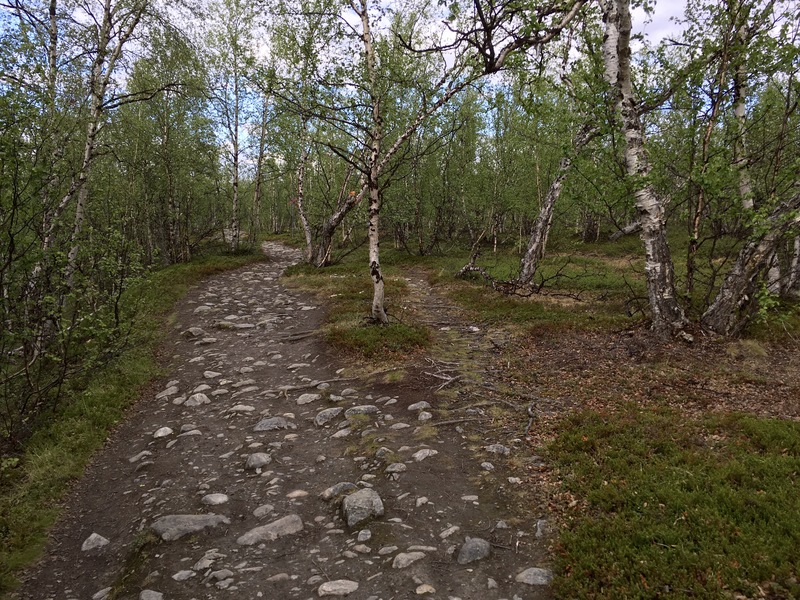 …until we came to the first of several marshes that we crossed on boardwalks. About a mile further, we finished our hike, three hours, out and back. Total for the day: 10 miles. 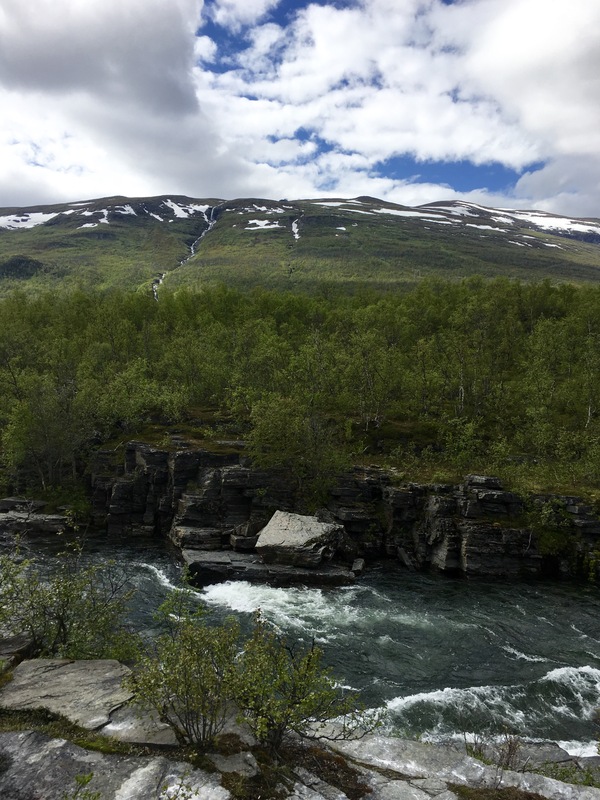 Nice day, but, unfortunately, our last outing here in Abisko.